The more I’ve experienced success and business in my professional life, the more I experience it in all other areas as well. People assume if you have one great thing going you shouldn’t take on more. But I’ve realized it’s not a zero-sum game, the more I add more, the more I’m forced to focus on the most important things in my career and family. Andrea Thomaz is a renowned social robotics expert and currently the CEO of Diligent Robotics. Her accolades include being recognized by the National Academy of Science as a Kavli Fellow, the US President’s Council of Advisors on Science and Tech, Popular Science’s Brilliant 10 list with her robot Curi appearing on the cover and MIT Technology Review’sNext Gen of 35 Innovators U 35. Andrea’s passion for social robotics began during her work at MIT Media Lab where she realized the opportunity to utilize AI to develop machines that address existing human needs, rather than developing machines before understanding how humans could benefit from them. 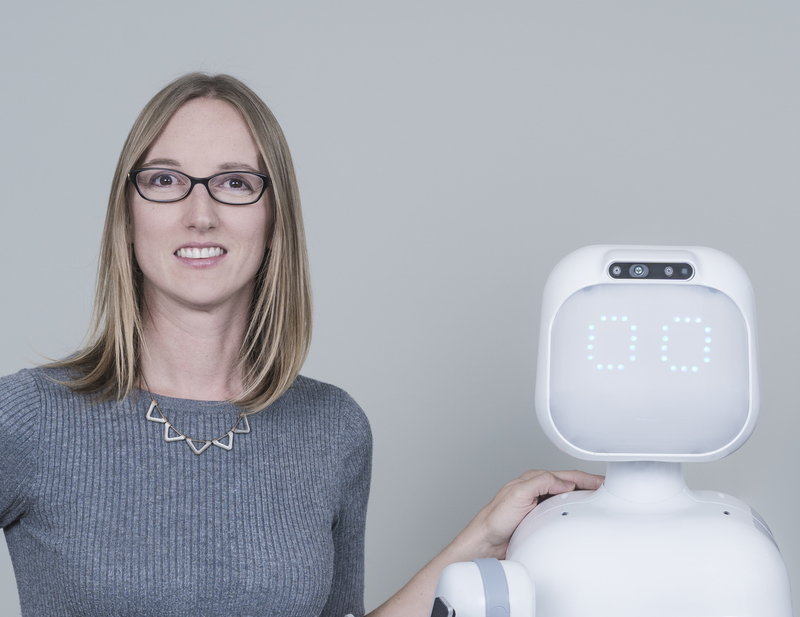 She co-founded Diligent Robotics to bring her vision of machines helping humans mainstream with socially intelligent robots that collaborate with humans by doing their routine tasks, so they have more time for human experiences. Andrea earned her PhD from MIT, BS in Electrical and Computer Engineering from UT Austin and was a Robotics Professor at Georgia Tech and UT Austin. The funniest story so far happened recently during our first beta trial of Moxi, our hospital service robot helping nurses, at Texas Health Dallas. We were demoing Moxi carrying soiled linen bags from patient rooms to the soil room for the hospital’s head of infection control who we needed approval on that task from. For this first demo of that task, we just put our personal jackets in the bag instead of using actual dirty linens. The great news was that Moxi was very successful demoing the carrying of the soiled linen bag to the soil room and impressed the head of infection control. The bad news was that we forgot we’d put our personal jackets in that linen bag in the soil room for a good few hours. When it hit me a few hours later, I rushed down to the soil room and found that the bag had already been taken out to the dungeon trash center and was about to be lost forever on the laundry truck pulling out. With the help of two hospital laundry staff who had taken pity on me in my quest for this needle in the haystack, I was able to stop the truck and the three of us rummaged through 10 buckets of dirty linen bags until finding ours, of course, in the very last bucket. For a split second I’d wondered if it was worth it, but it turned out that not only were a good few of our nice jackets in there, but our Head of Product’s car keys and wallet was also in her jacket. One of the unique challenges I’ve surprisingly faced from some, is an assumption that because my co-founder, Vivian Chu, and I both came from academia and have technical backgrounds, we are less serious and credible business people. We pride ourselves on focusing first on one thing: our customer. We actually initially tried to bring in a few external business-only focused individuals to our team, but we soon realized their goals didn’t align with ours. Yes, we’re a startup that will grow sizably, but the pace of that growth isn’t our first goal. Our first goal is our customer and making sure we fully understand their needs and create a customizable robot that can really help each individual one them. We’re dealing with a robot operating in one of the most critical environments, the hospital, so becoming a unicorn startup and growing at that type of pace would mean we wouldn’t have the same type of oversight and steadiness that we need. In turn, we decided to hire our Head of Product, Agata Rozga, who specializes in psychology and leads our product efforts in terms of really understanding our customers’ needs; what tasks burden nurses, what do nurses’ daily routines look like, what would nurses perceive as helpful and so on. We still face the challenge of some questioning our business skills, but we’re glad to finally see most people now understanding and really appreciating our business growth strategy. One of the most important things I’ve learned through my time as a professor is how to help and teach students; all of whom have very unique talents and purposes in the world. As a professor, you have to treat all of your research assistants as independent entities who will go off and create something incredible by themselves vs. at a company when you’re training your employees to help you create your idea. But teaching people to become their own independent entity really helped me understand how to help people embrace their most unique talents, interests and processes. While our employees are working towards the same larger goal at Diligent Robotics, there are so many different areas of expertise needed in our robotics department alone. Vivian and I really try to bring that professor teaching skillset into Diligent by helping each of our employees understand their unique super power and help them grow as an individual with us. There are so many people in my life, professionally and personally, who I’m grateful for, but I’ll mention three in particular. The first is Cynthia Breazeal, my advisor from MIT Media Lab, so much about how I view the world of AI, Robotics and the potential impact it can have on people, I learned from her. The second is Henrik Christensen, who I worked closely with at Georgia Tech. He’s been such an instrumental part of defining the national agenda for robotics research and really taught me how to think about my potential impact on this world on a much more macro level. And the third is Manuela Veloso, a professor at Carnegie Mellon who I never worked directly with but has been a very important mentor and cheerleader throughout my journey from academia to creating a commercial product. Manuela has taught me to be formidable, when it comes to not listening to anyone who says you can’t do something or not waiting to do important life things like have kids until after you hit a certain professional point. She really has helped me believe in myself and feel confident doing the things I think are best. With two young kids, the most crucial tool for me balancing my family and career has been my husband. He is also a professional in academia and we’ve found a really important life balance between us and both of our careers. We’re rarely both 50/50 in terms of equally balancing kids and work, but we balance out over the years. A few years ago, when he was finishing his PhD at Georgia Tech, we were 75/25; he was 75% work and 25% kids, I was 75% kids and 25% work. Now that I’m on this professional journey with Diligent, we’re swapped. Actually, the opposite; I think the more I’ve experienced success and business in my professional life, the more I experience it in all other areas as well. People assume if you have one great thing going you shouldn’t take on more. But I’ve realized it’s not a zero-sum game, the more I add more, the more I’m forced to focus on the most important things in my career and family. The busier I am, the more present I am in each moment and the more value I have on my time. I now implement forced disconnection; every day I leave the office at 5:30pm and sign-off fully until 8:30pm when my kids go to sleep to be totally there with them for the evening. There’s always so many places you can be and things you can be doing but having kids has helped me understand how precious time is and I only need to focus on things that will have an impact. I’ve learned to delegate and trust other people, which in turn has made me be a better leader. I recently heard an inspiring talk by Mauria Finley, the CEO and Founder of Allume, where she discussed how she chooses to hire more working mom’s as employees as she knows they have incredible time management skills. Find something other than work to be responsible for and proud of, whether that’s kids, pets, hobbies, exercise, or something else. Having something else to be responsible for is a forcing function into work life balance as you highly value both (or more) entities. It’s always a good time to add more crazy to your life. So many people wait around to have kids or move cross country or purchase that expensive exercise class membership, because they think their lives are too busy right now and there will be a better time to take those things on. But I’ve realized those other things are such important milestones in life, and the more crazy you add to your life, the more you enjoy your life and the more you value your time. The most mind-blowing thing for me now is seeing how far Diligent has come in just one year. Last year on January 3, 2018, Diligent was still only just Vivian, Agata and me, and we were working out of one of our investors’ offices (thank you Next Coast Ventures!). I remember it was around this time that Moxi’s arm was finally delivered to the office, but we weren’t even close to finished development yet. It’s truly incredible to take in everything that’s happened in the past year; we closed our seed round, hired around 10 employees, finished creating Moxi, successfully completed Moxi’s first beta trial in a real hospital and met the most incredible nurses and hospital staff that continue to reaffirm for us that what we’re doing will help them. My entire professional career has been centered on creating social robots that help everyday humans in assisted roles. Think about all the busy work people do that robots with higher levels of social intelligence (in terms of directly helping individual humans as their teammate vs. industrial type robots that don’t work with humans) could help with? I really do see a future where robots don’t replace human jobs, but really help humans work and navigate their daily lives more enjoyably.